I heard on NPR once that we have a finite amount of willpower each day. This willpower, also referred to as mental energy, is depleted each time we exercise it. Making decisions, enduring unpleasant experiences, deferring satisfaction. . .all these things use our willpower. Something as simple as waiting to use the restroom when you really need to go is a drain on your willpower. Parenting requires a LOT of self control, and therefore a lot of willpower. Have you ever felt like you’ve reached your breaking point around 5 pm? 11 am? Haha! The interviewee posited that since willpower is a limited resource, we should be aware of how we are using it. I know parenting and running a household get most of mine, leaving the well a little dry for the sewing side of my life. I don’t like to practice. I don’t want to make a test block when that time could make a real block. I don’t want to make a sample quilt sandwich and test out quilting. I prefer to practice my skills on the real deal, but starting real + small is definitely advisable. I don’t like to re-do. Ripping. Is. The. Worst!!!!!!! I already sewed it! If I’m going to UNsew it, it has got to be bad. 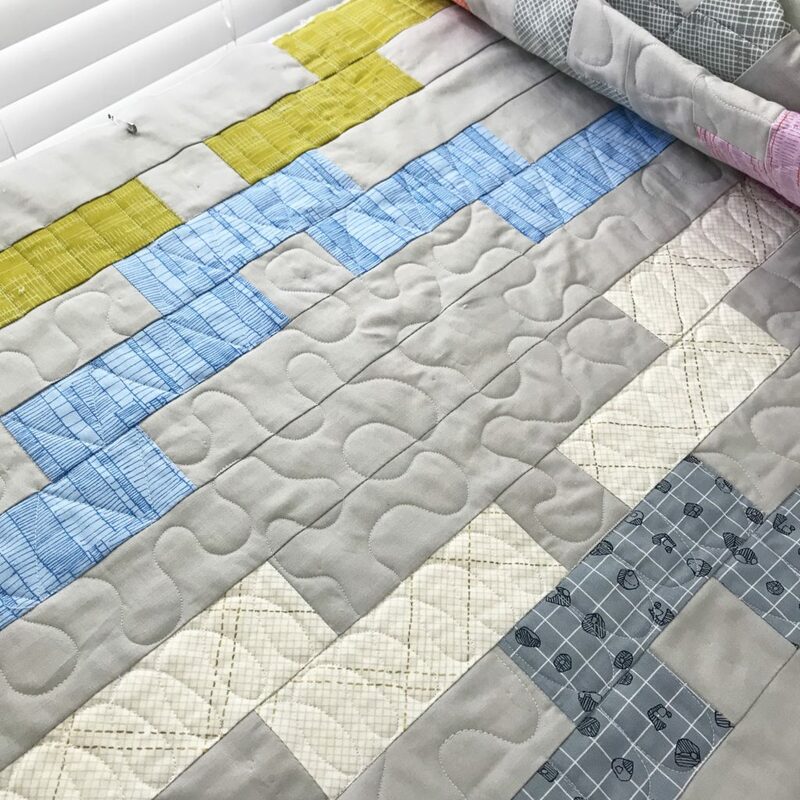 I rarely rip out quilting barring a major tension disaster or other machine malfunction. 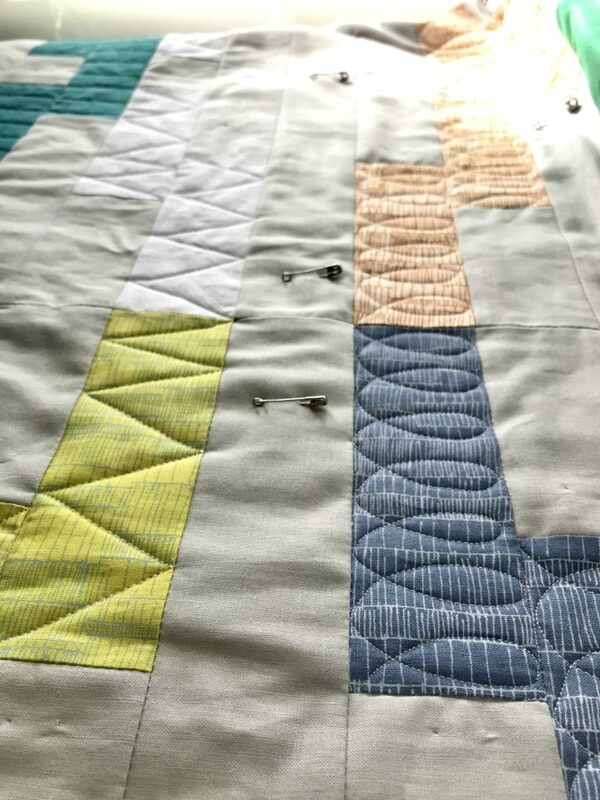 For me, quilting is the slowest to unpick and the most rage-inducing. AVOID. When I quilted my pineapple quilt I used a light pink thread. Since that project took me fiveever, I did a little piecing of other projects for breaks and one day forgot to change my thread back to the pink. I FMQ’d hearts for a good 20 minutes with white thread! YES. . . I cursed! NO, I did not rip. This quilt is me and my quilting at this point in my life- minorly flawed but mostly ok! This stunning pattern is achieved using big paper pineapple blocks from Amber @gigisthimble, and I love it to pieces. 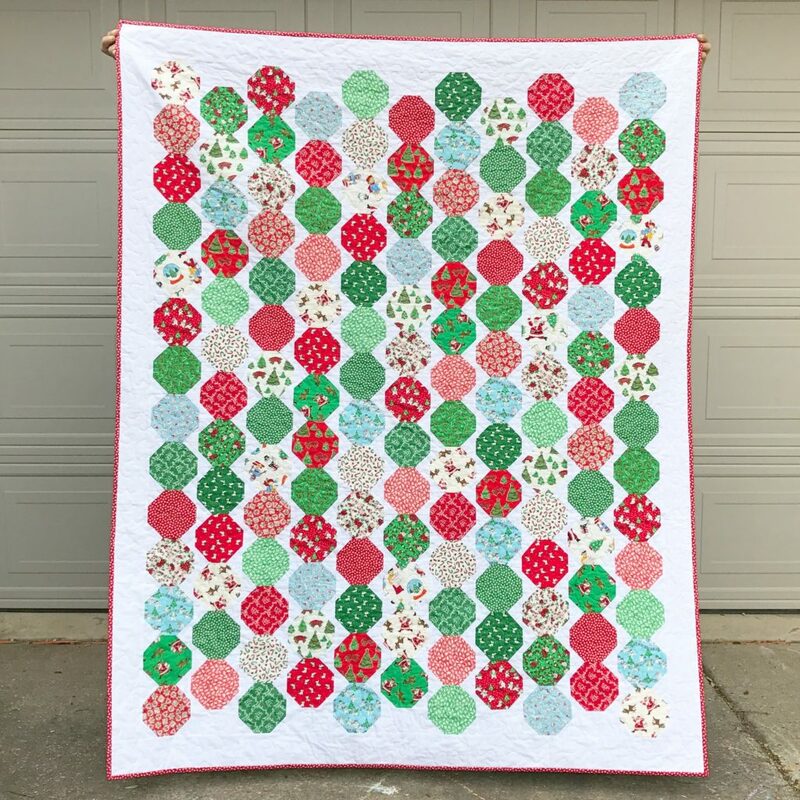 My first quilt to free motion all over was my Garland Quilt, pattern by Keera Job @livelovesew . I decided to do a stipple and lordy was I surprised at how much muscling is involved in FMQing! Some areas are a little tortured and jagged- not the smooth, rounded stipple I see so many photos of. 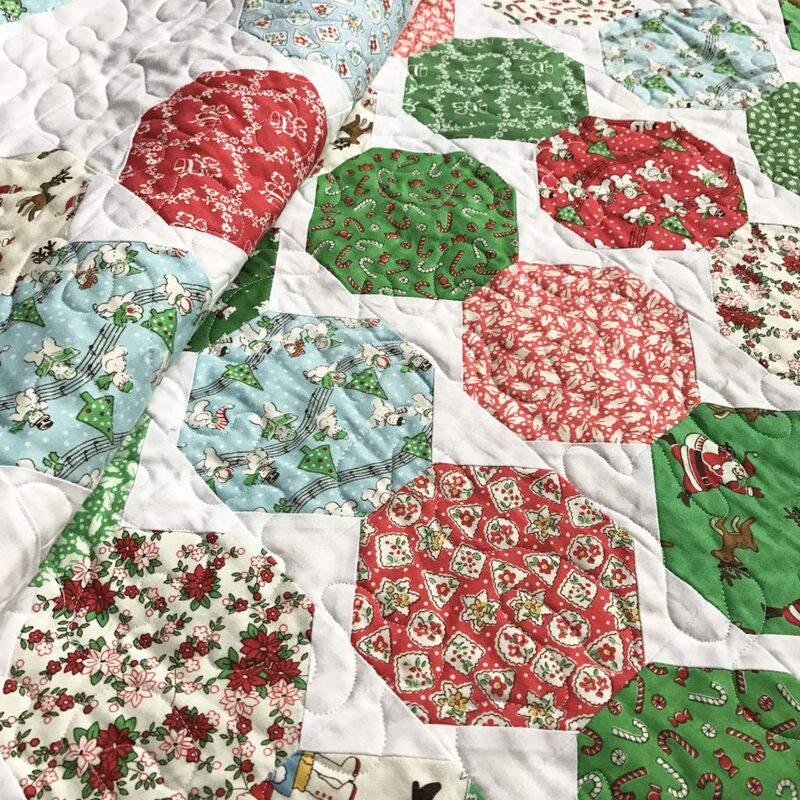 The wonderful thing is, despite the amateur quilting, it is a gorgeous holiday quilt! 10 years from now when I’ve mastered the stipple (HAHA) I will look back fondly and remember how my shoulders ached and my stitches were uneven and how I was *LEARNING*. 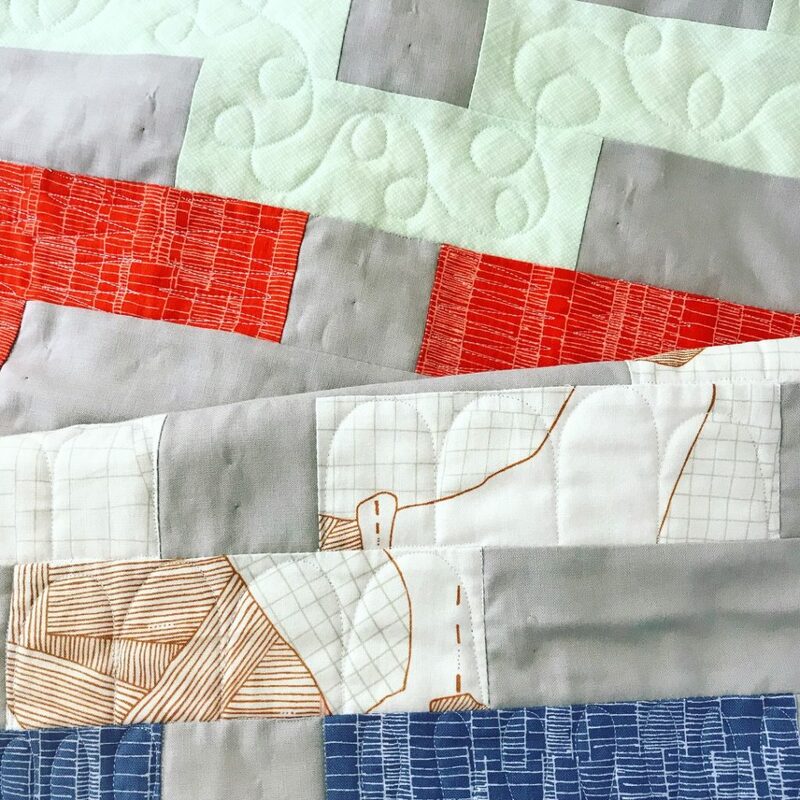 If you follow long arm quilters on instagram you are seeing some of the gorgeous detail work they can achieve both freehand and with rulers in custom quilting. 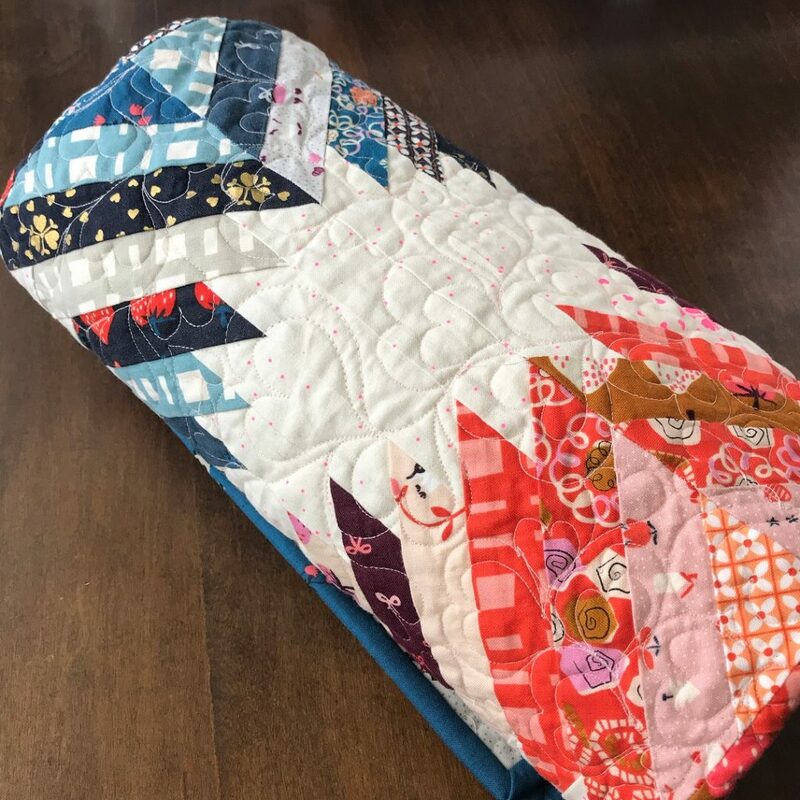 I have been admiring the use of different quilting patterns within different blocks and sections for a while now and decided to give it a go on my trusty JUKI! 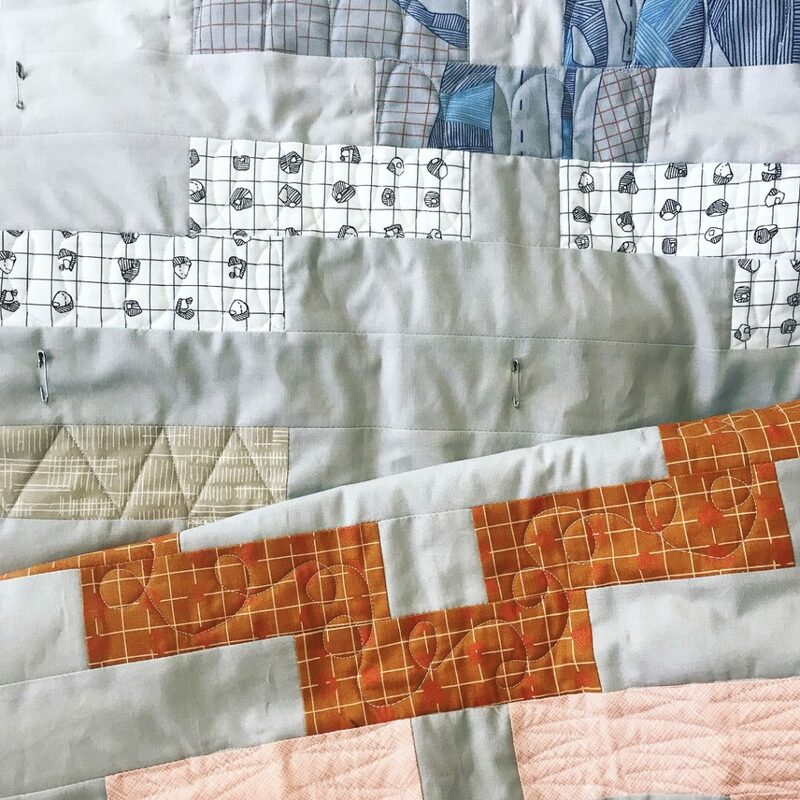 My Interlock Quilt, pattern by Amy Friend @duringquiettime, seemed like a good contender as it doesn’t need to be finished by any sort of deadline. I picked a print row to start with and thought “TRIANGLES”, so triangles there were. The next row “RECTANGLES” came to mind, and hence they appeared. You can see how scientific and precise my planning process is! I’m now working on a large meander in the solid spaces and loving the texture. If it brings you satisfaction to match every point and smooth every pucker, DO THAT! If it’s better for your crafty zen to let some of those things go out the window, DO THAT! 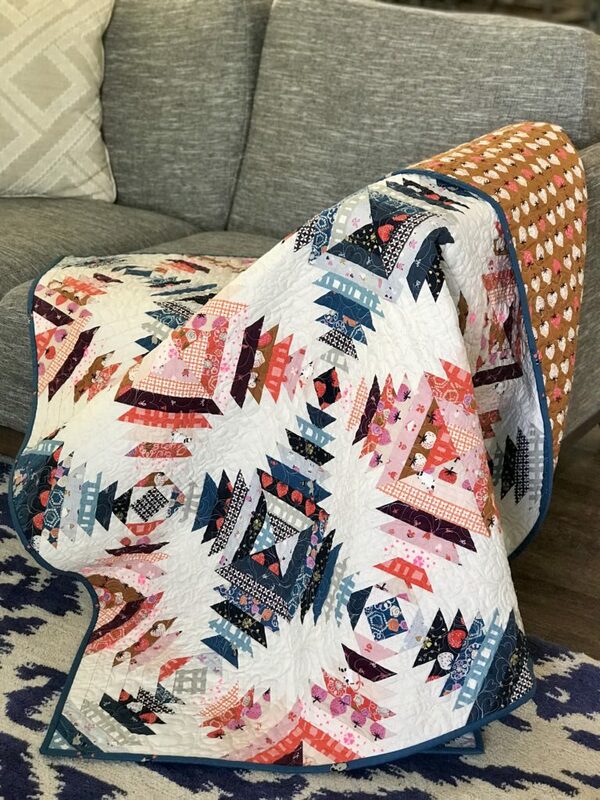 You can make amazing beautiful quilts that have mistakes. 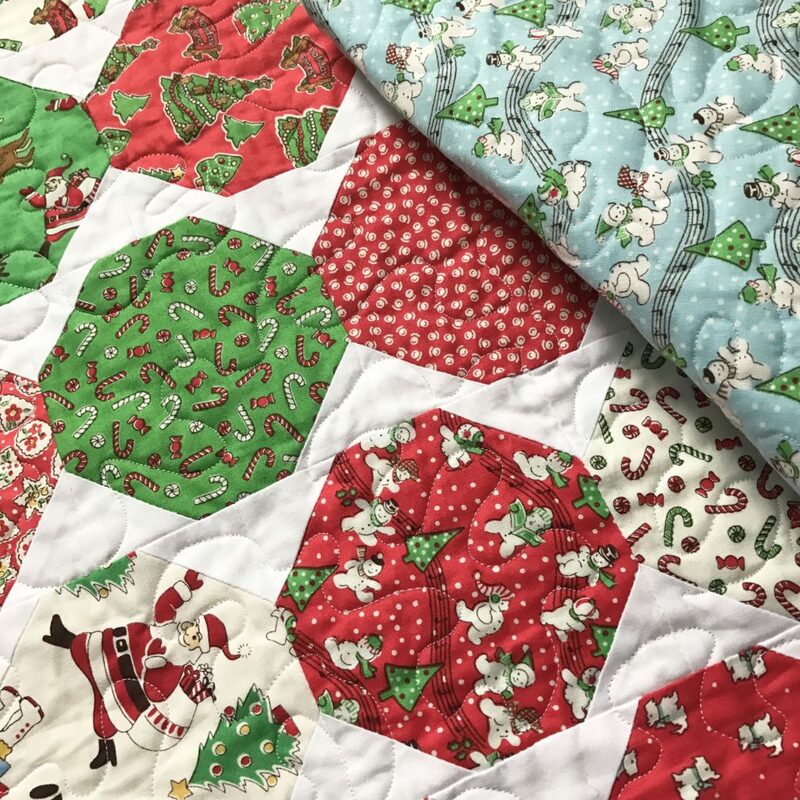 You can free motion quilt even if you aren’t good at it yet! I learn something new every time I quilt out of my comfort zone. So with that, go forth! Pee when you need to! Make mistakes! Be fabulous! 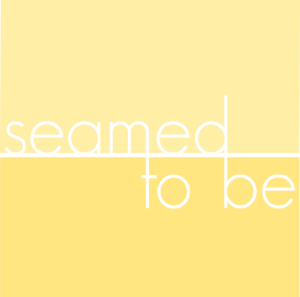 subscribe for the latest seamed to be news!